Don’t let tooth loss impact your smile and appearance. Implants can help. If you are an adult who is missing at least one tooth then you may be considering the different treatment options in Frederick, MD, that can help you get a complete smile again. Find out why so many people are turning to our general dentist Dr. Frederick Asuncion to get dental implants. Do you want a replacement tooth that both looks and functions like a real tooth? Do you want a restoration that could last the rest of your life? Do you want an artificial tooth that is easy to care for? 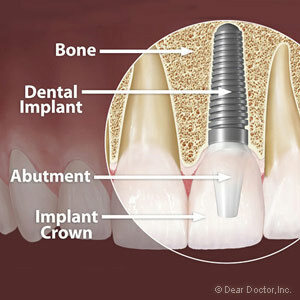 The purpose of a dental implant is to replace the roots of a tooth, which are hidden below the gums. In order for an implant to be functional, our Frederick, MD, restorative dentist will need to surgically place the implant into the jawbone where your missing tooth used to be. Once the implant is placed, it will begin to bond with the jawbone over the next several months. During this time, a naturally occurring process known as osseointegration happens. This is where the bone grows around the implant and fuses together with the metal post. Once this happens, the bone and implant become one, providing a permanent foundation from which to hold your false tooth firmly in place. From there, the abutment will be secured on top of the implant. Once your permanent crown has been made, you will come back into the office so that we can check the crown and then cement it in place over the abutment to complete your new smile. Are you interested in getting dental implants in Frederick, MD? Want to find out if you are the ideal candidate? If so, call Asuncion Dental Group today to schedule your consultation. The American Academy of Implant Dentistry estimates that approximately half of a million dental implants are installed by dentists each year to replace missing teeth. Implants can be used for single tooth replacements or to fill in multiple gaps across the smile. Although dental implants aren’t right for every patient, they could be just right for you! The team at Asuncion Dental Group in Frederick, MD can help you make that decision. If you find out that you are a good candidate for dental implants, you should seriously consider this tooth replacement solution. Your Frederick, MD, dentist needs to find plenty of healthy bone tissue in the jaw where you want the tooth replaced. Implants need the support of a robust immune system to heal as quickly as possible, so you should be in stable general health. If you have some dental anxieties, relax knowing that there is nothing to be worried about when you go in for your first dental implantation appointment. The area of the mouth that your dentist will be working on will be numbed with a sedative so that you’ll have a comfortable experience. The appointment is relatively short, only requiring about a half an hour to one hour to have the implant positioned. You’ll return to the office a few months later to get impressions taken for a permanent crown. When you have a tooth replaced, the best option is one that will give you the most comfort and versatility. A dental implant is the ideal choice in most cases. Call (301) 620-8882 today to schedule an appointment with Dr. Frederick Asuncion at Asuncion Dental Group in Frederick, MD.